It’s not fair to evaluate a new series in comparison to its betters, but Low Winter Sun is a victim of those comparisons nonetheless. Viewed in isolation, each new show can and should be judged on its own merits. However, as each new TV season continues to produce shows which expand the notions of what television can be, a show that simply does what has been done before, however competently and handsomely mounted and no matter how dutifully it apes elements of those superior predecessors, is going to seem tired and thin. 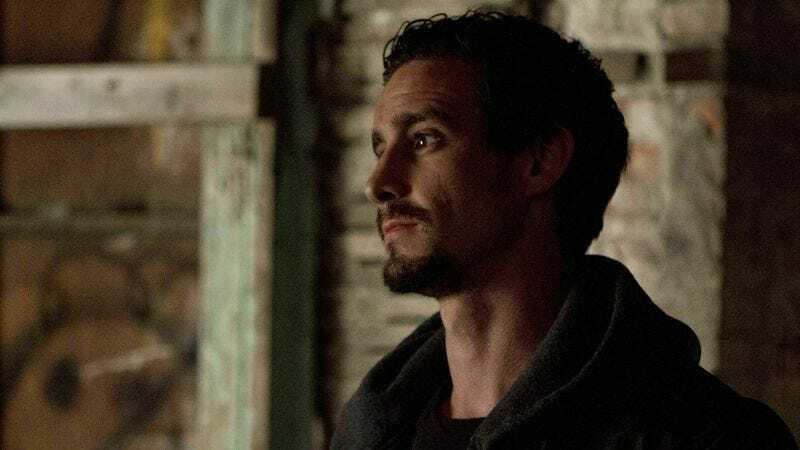 Despite its handful of good actors and an evocative setting in the crumbling cityscape of Detroit, Low Winter Sun, by the end of only its second episode, seems to have laid out all its cards—and it’s a weak hand indeed. Would this be less so if there had never been shows like The Wire or Breaking Bad (the two exemplars it clearly wishes to evoke)? Perhaps—but it would still remain thoroughly undistinguished television. The episode opens, as did the pilot, with a slow pan around Mark Strong’s molded skull, a motif that’s edged into cliche in a short space of time. From the first shot of the series, a long, languorous tour of its protagonist’s head (culminating in one gorgeous tear stealing its way down his chiseled cheek), Low Winter Sun has employed Strong’s features as a form of storytelling shorthand. And while Strong’s visage seems ideal for the task, with his raptor’s mien offset by incongruously soulful eyes, this fetishization of his dome is emblematic of the show’s prosaic visuals. See, Frank’s a hard man with a soft side. And he has a lot going on inside his head. And we’re going to, very slowly, circle that head until viewers understand those points. Not that Frank doesn’t have a lot going on in there, you know since he helped fellow cop Joe (Lennie James) kill Joe’s crooked partner Brendan (because Joe convinced Frank that Brendan had killed Frank’s Russian prostitute girlfriend), and conspired with Joe to make Brendan’s death look like a suicide, only to discover that Brendan was due to implicate Joe in an internal affairs investigation the next day. Oh, and then Frank was put in charge of investigating what happened to Brendan. And his girlfriend may not be dead. It’s both a lot of and too little plot, since Low Winter Sun introduces each new twist with a perfunctory thud at regular intervals, aided by stock cop show dialogue that plops into place in the viewer’s mind a second before it’s uttered. (“Thanks for havin’ my back with Boyd.” “How long you gonna have Joe cool his heels?” “At least until we know what Brendan was into.”) It’s not that it’s bad dialogue (although sometimes it is); it’s that it’s “cop show dialogue.” We’ve heard it, and no matter how enthusiastically Strong and James growl it, conspiratorially whisper it, or shout it with guns in each other’s faces, it remains resolutely ordinary. A remake of a British miniseries (also starring Strong), it’s hard to imagine Low Winter Sun introducing enough worthwhile new material to fill out an entire season’s order of episodes (and possibly beyond) without the stretchmarks becoming too obvious. As it is, the B-story feels superfluous, and the main narrative is barely holding together, thanks to the manful efforts of Strong, James, Bones’ Ruben Santiago-Hudson (playing yet another put-upon authority figure), and reliable scene-thief David Costabile (another Wire vet) who, as the requisite “distrusted because he’s a cop who investigates other cops” IA detective, manages to squeeze some juice out of his predictable lines. (When ordered off a crime scene because of “jurisdictional bluster,” his smugly smiling, “I’m not leaving” is as near to personality as anyone on the show manages.) And James brings a sly physicality to Joe—a smaller man, he has a surreptitiously cocky undertone to his movements that’s formidably alive on screen. Here too, however, talent can only carry the show so far—in the episode’s climactic showdown between Frank and Joe, complete with beatings, revelations, and the old gun in the mouth ultimatum, we’re left admiring the craft because the characters don’t involve us. Frank has done a bad thing (killed a cop) because he was convinced that cop did a bad thing (kill Frank’s girl), and now he doesn’t want to get caught. That’s all the motivation he’s given to be our antihero, and in a world where we’ve seen what a real TV antihero can be, it’s simply not enough any more. That’s Detroit blues legend Bettye LaVette seen singing the theme song. She’s very good. Costabile swallows the last words of his line about “jurisdictional bluster” with a little giggle, as if he’s trying to save them from themselves. As vapid as Frank’s flashback to the glory days snuggling with his girlfriend are (Todd called them “terminally silly,” and he’s not wrong), this episode doubles down on the laziness by replaying the exact same scene when Frank thinks of her. Did they only ever have that one conversation? Also, Frank, a hard-boiled Detroit cop should not blithely say to his Russian prostitute girlfriend with the haunted eyes, “I want to know everything about you,” without expecting a sad, “No—you don’t” in return. Dirty cops should be glad no one ever watches their eyes when they cast meaningful glances at their co-conspirators—the jig would be up in five minutes. Damon’s bartender wife (Sprague Grayden) is the show’s vision of the tough woman, so she gets the following mouthful of “tough broad” dialogue, “I think six months ago, you all were scrapping copper. And now Damon has you sittin’ here with 200G worth of coke in your lap, and you’re actin’ like it’s a problem instead of the first good thing this city’s doled out since you got handjobs after the Dream Cruise.” The Dream Cruise is apparently a vintage car event in Detroit. She knows that because she’s from there. In director Ernest Dickerson’s hands, Low Winter Sun continues to look good, although it still feels like a tourist to Detroit and not a resident—like the locations person found “just the perfect dilapidated row house” for each scene. Detroit readers—am I wrong?